Jersey winger Tom Howe says the club are capable of making the Championship play-offs. The islanders are on a four-game winning run and have lost just one of their last seven matches after Howe scored a hat-trick in Jersey's British & Irish cup win over Connacht Eagles. Jersey return to Championship action when they travel to Penzance to face Cornish Pirates on 27 December. "We're hoping for a top-four spot after the Pirates game," Howe said. 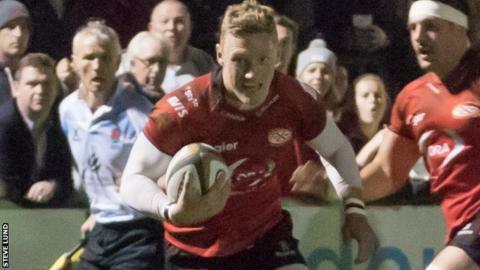 The top four sides at the end of the regular season in English rugby's second tier play off to decide which side will be promoted to the Premiership. "We're on a bit of a run now, the players are playing with confidence and it's really starting to show," the winger, who is on loan from Premiership side Wasps, told BBC Radio Jersey. "We're sixth in the league and it's so tight at the top that anything could happen."